For a brief period, between 1739 and 1746, this painter of amorous mythical scenes extended his repertoire to contemporary genre scenes, influenced by 17th century Dutch masters and more directly by Jean-François de Troy. 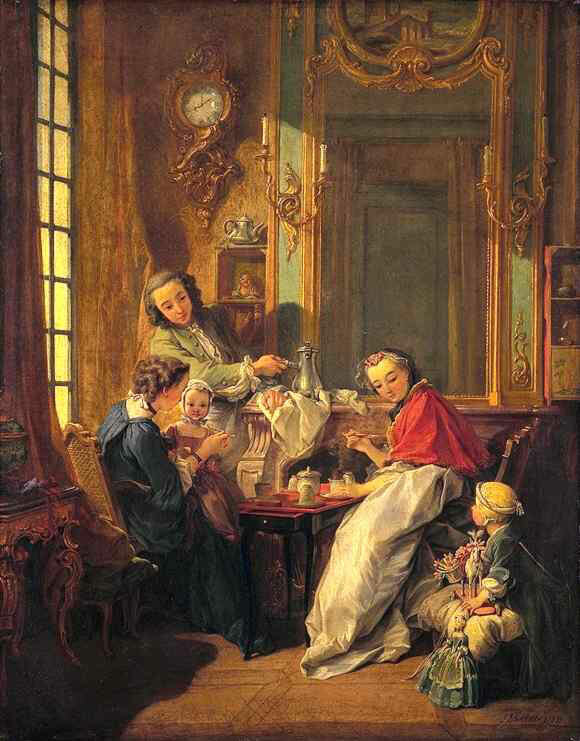 This picture describes in detail, with a dazzlingly fresh, graceful style, a scene of daily life in a Parisian family -like that of the painter himself, who was at that time father of two small sons- devoting themselves to the new craze for coffee. The painter of happiness has captured, with a gentler eye than Chardin's, a certain art de vivre which is vivid to us still.